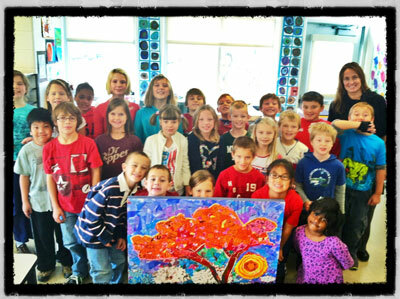 A collaborative work between artist Stephanie Schlatter and the third grade artists at Ada Elementary in Ada, Michigan. Song of Life is a work about kids helping kids. The third grade children at Ada Elementary learned from Jane Kurtz of Ethiopia Reads about how the children of Ethiopia learn. The children of Ada wanted to help raise money to improve schools in Ethiopia, so local artist Stephanie Schlatter came up with this acacia tree project. 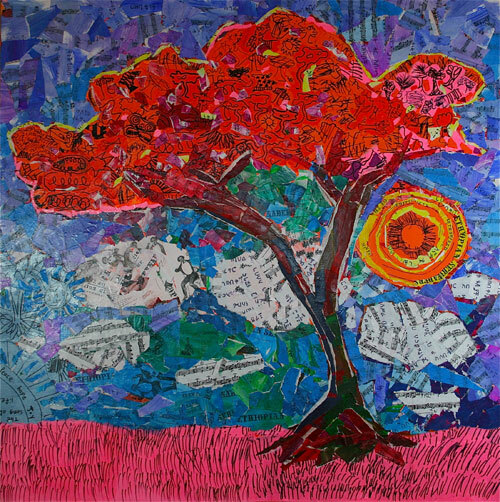 In it, each child in class created a collage of an acacia tree made up of torn Ethiopian sheet music and little drawings of trees, sun, grass, and all the things you might find in an African landscape where children in Ethiopia find acacia trees. Stephanie used their little pieces as a guide to create a larger work of art – the one you see before you in Song of Life. Acacia trees are what the children in Ethiopia see every day, a symbol of hope, strength, and perseverance often found in the desert. Those children need the inspiration of the acacia every day on their way to school. Many live on the wild open plains of Ethiopia where a daily trek to school can be tens to many tens of miles. Others live in dangerous urban environments faced with treacherous street poverty. Ethiopia Reads Art Aid raises money to build and support local schools to give Ethiopia’s children a closer, safer place to learn. 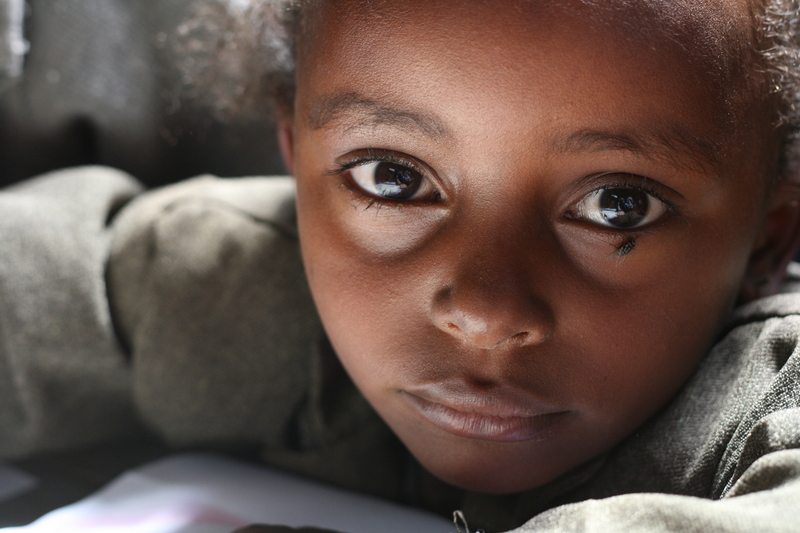 The Song of Life auction helps provide a safe haven for hundreds of these sweet children in Ethiopia. It’s kids helping kids have a basic human right to a hands-on quality education. I love the countryside of Ethiopia, with its rolling hills and open spaces. I relish in escaping the urban chaos of the capital, Addis Ababa. So it was with a smile on my face that I arrived in the rural village of Ekodaga to the north. I had come to this Tesfa Foundation School to teach an art class. Ekodaga is a very small village, a cluster of huts about a half-hour walk from the town of Chancho. There is no road leading to Ekodaga, just a vast field with some cows, a few shepherds, and in the dry season, our mini-van, much to the dislike of our driver. Happiness came over me when I saw the school. A school where none had been before. A school the Tesfa Foundation had built. It is painted bright blue and green. There is no electricity, but with the African sun shining brightly through the sky lights, that doesn’t matter. The children had prepared for our visit, welcoming us with a traditional coffee ceremony and song and dance. Their little faces with big beautiful brown eyes had broad smiles spread across them, and something else, too: pride. Pride that comes from a village that has a school, and they were attending that school. After spending some time getting to know the children, we focused on the business of making art. 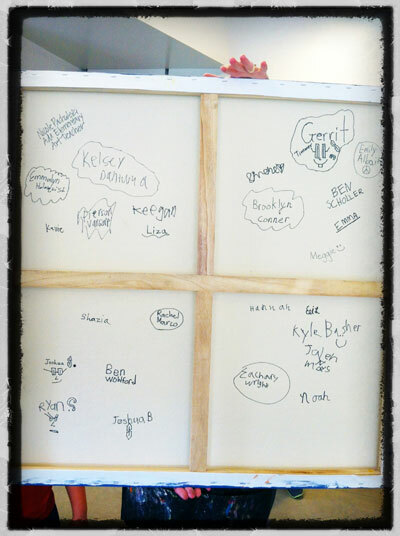 After I explained the lesson and did a brief demonstration, the children plunged head first into their art. The lesson was to think of their surrounding landscape and paint it. Once they began, we rarely saw their eyes again, just the tops of their heads as they immersed themselves in their little masterpieces. It is pure joy working with kids who have not yet learned to be self-conscious about their artwork. Reluctantly, when our lesson was complete it was time to leave. I felt that familiar tug on my heart that means I’ll be back another day, but not soon enough. I was sad as our mini-van pulled away, leaving my new friends behind. 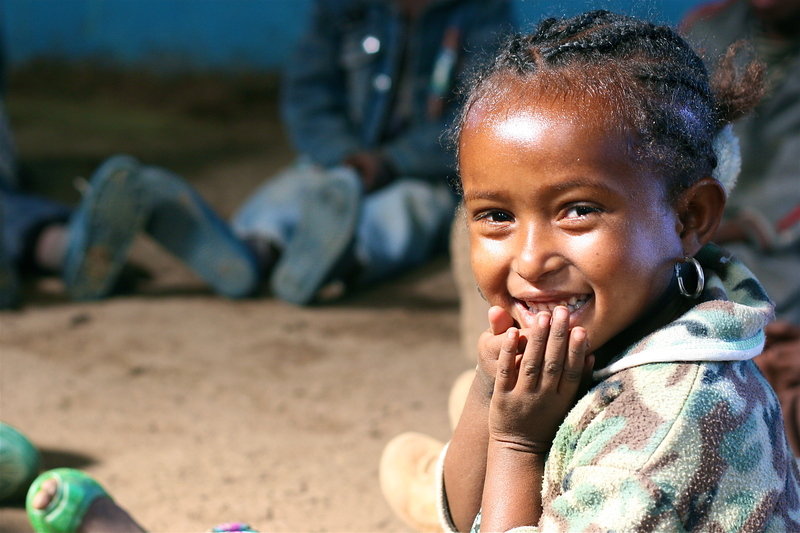 I was comforted by the work we do at The Tesfa Foundation, knowing that without our generous funders, this organization, and the hours of volunteer labor, these kids would not be in school at all, and my visit to Ekodaga would have been very different.